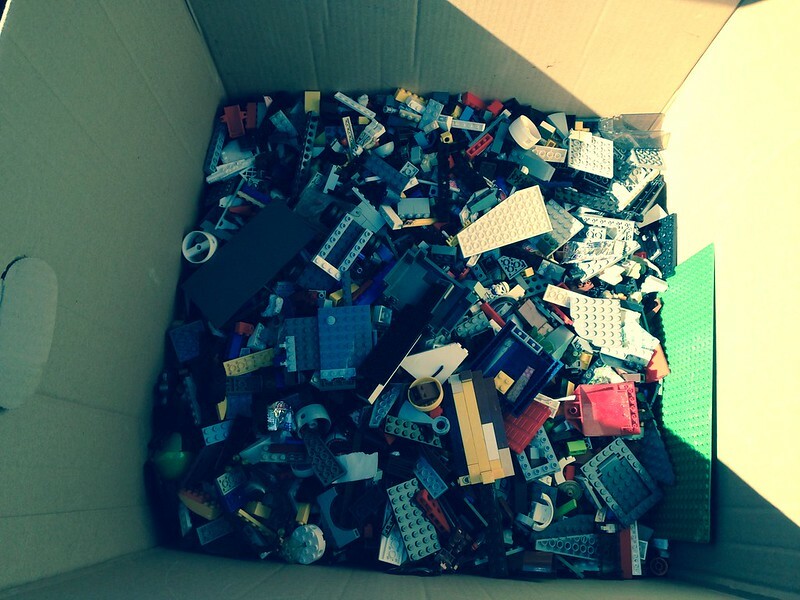 I bought a large box of Lego parts from a young man that was selling his childhood collection. In his listing he said that there was "about" 40-50 pounds and "not much" Mxxx-Bxxxx. I was surpised when he answered my inquiry as he asked for $350.00 and I had offered him only $200.00. Anyway I decided to chronicle me efforts to turn them into usuable bricks. For starters the unsorted weight was 36lbs 13oz. so did quite make the 40# mark. Current cost = $5.40/lb. I knew that the parts were dirty in the parking lot but didn't realise how dirty until starting the task. They were filthy. I sorted in gallon bag incriments. Average bag weight was 3#. 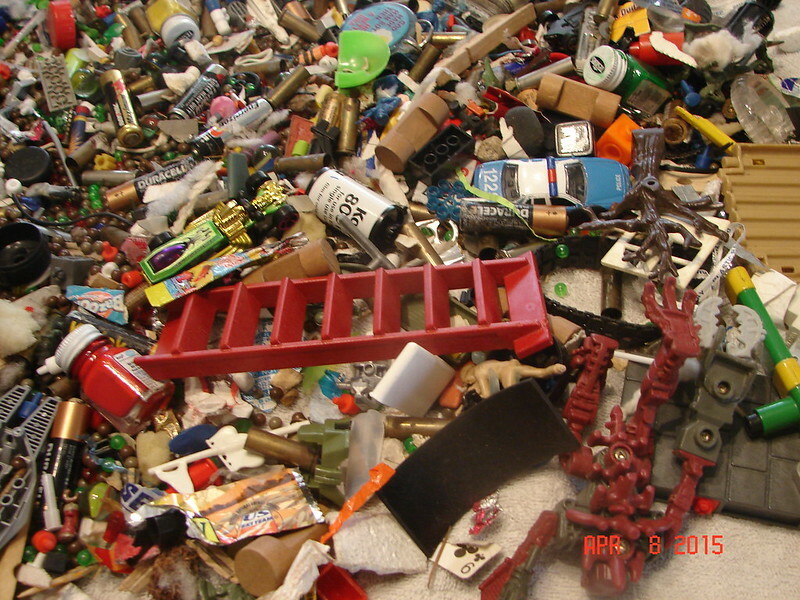 On average, it took about 2 hours per 3# bag to sort out the junk and into predominate colors as pictured here. 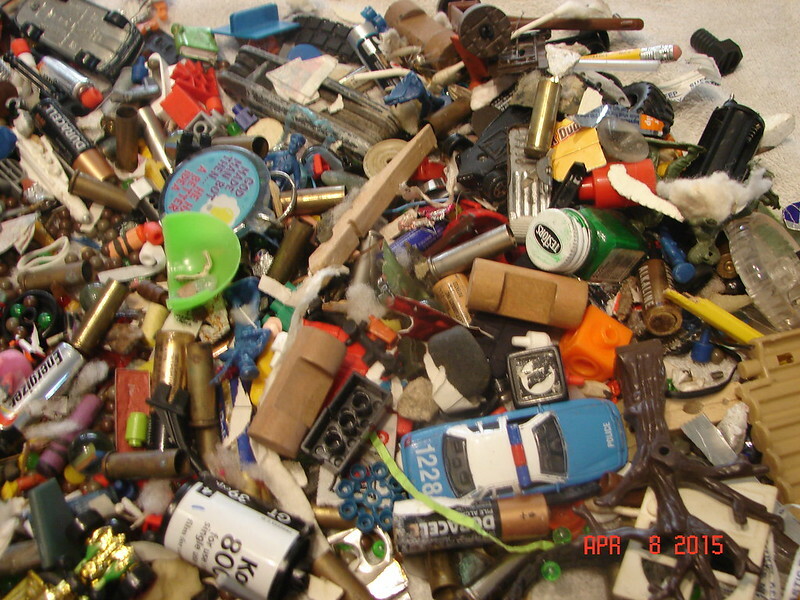 Here's some pictures of the trash that I sorted out: There were corroded batteries, jars of Testor model paint, pretty rocks, Matchbox cars, .357 shell casings, and load of small pellets. -Total of usable parts: 22lb 11oz. After sorting all the parts, I spent a several hours washing and drying them. Last step for me is to sort into various sizes. I have 6 general catagories: 1x1, 1x2, 2x2, 1xbigger, 2xbigger, plates and larger pieces. In total, Im sure that I spent at least an hour per pound. So the bottom line.....NEVER AGAIN! That is some really nasty junk. I hope you seriously disinfected the LEGO you were able salvage from that mess. Sorry that happened to you. Unfortunately some people don't care for their collections and aren't very fair about selling them, which can give a bad reputation to buying used LEGO, but there are still good deals to be had out there. Just the other day I managed to find about a gallon of near-pristine early 2000s-era bricks and some classic Ninja figures in great shape for $2 at a garage sale. Look at the bright side: you've saved some LEGO from being nothing but a bucket of trash for all eternity. Ive had my share of good Craiglist deals. This just wasn't one of them. And yes, all parts went through a bleach solution and a sun bath to disinfect them. Yikes... So sorry to hear about that one. Glad you chronicled it for us, as people tend to only talk about the great deals! I've had my own horror stories with bulk buys off Craigslist. Bought one lot that said it had a train in it (had a motor and some track, but oddly no pieces of a train), went from 32 lb to 23 pounds after sorting out junk and clone brands, and completely, utterly smelled of smoke. It took me 4 months of airing out, washing, baking powder, washing, airing out, etc... before they were finally smoke free. The dinosaur figure and wheels were the worst, as they just wouldn't let go of the smoke smell. The guy loading them into my car smelled so heavily of smoke that I didn't realize that the bricks smelled like that as well. (Yep, should have known better, but I didn't at the time.) Let's just say I have been much more careful asking about owners smoking habits before I go to meet anyone since then. Ouch, I would never do this to anyone. Sorry for your awful experience. 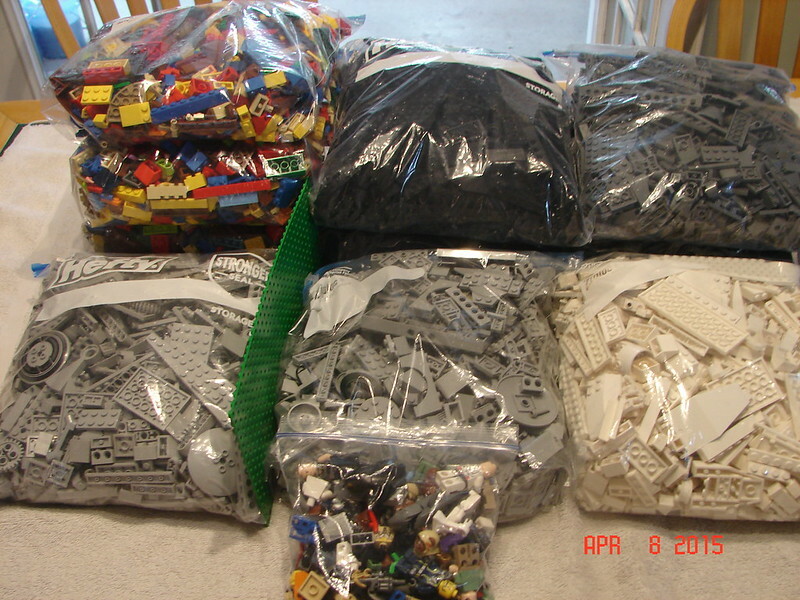 Yeah...you can find amazing Lego deals on craigslist, but yeah, this is not one of them. Ouch. 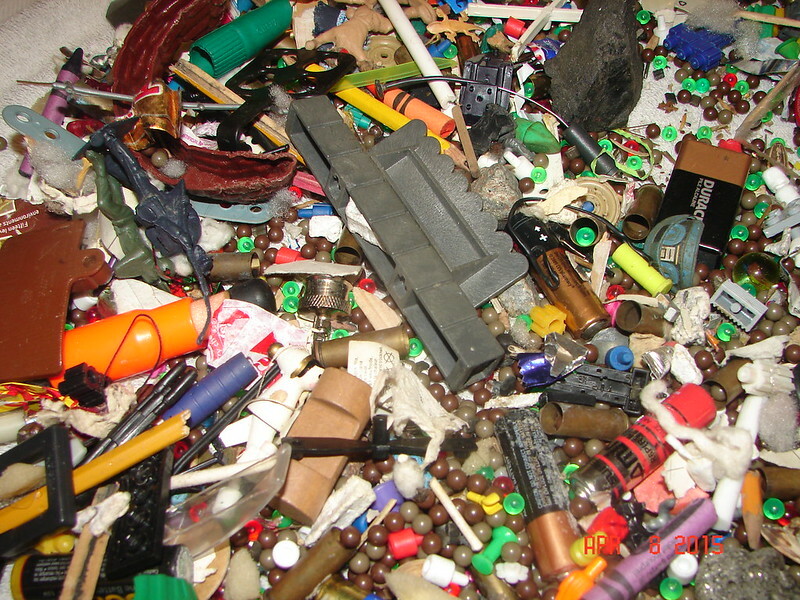 Shell casings in amongst kids' toys, and people think that's normal? That's 38c profit right there! I say "never again" but I know that at some point I probably will buy another lot of some former child's Lego. This is the second time I've done it and this lot was similiar to the first (but it wasn't as flat-out dirty). 2. As Ronyar says - take a pass if you suspect the owner was a heavy smoker. 3. Plan on a 25-30% loss due to junk and Off-brand. 4. Decide if an hour or more (per pound) is worth your time. 5. Be wary of an excessive amout of Bioncle parts.This lot hard suprising few. The pile of junk mixed in just blows my mind! :( But thanks for the lessons learned, I haven't ventured into buying lots off of Craigslist yet, and am weary. the closest i've had to a lego craigslist transaction was when i discovered a lego seller/trader who does flea markets listed an ad on CL for his flea market booth. No complaints. I've been to his booth about 3 times and I've done an in public meet=up for orders from his lego store(one trading, one buying) 2x and a third order I did on Saturday(trading) just went to processing today. That's not junk. They're relics! ^"I present to you, The Shell of Winchester!!" Sort of makes you want to treat it with more respect, doesn't it? Can't be worse than when I found a family of mice living in my box of Lego. 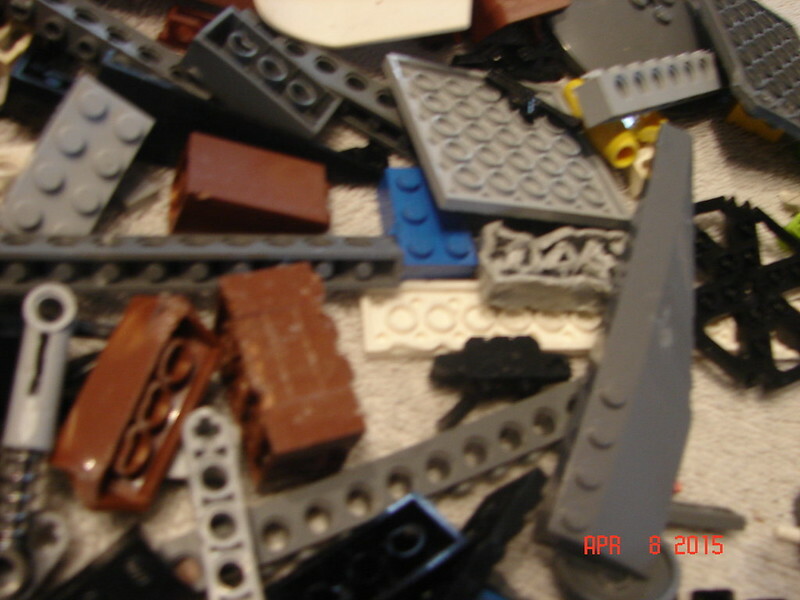 Nothing like finding feces, blood, fur and afterbirth all over your precious plastic bricks. Ugh!!! @TheLoneTensor - Ha! The voice in my head actually changed to Charlie Brown's by the second sentence when it registered what I was reading! Never had a lot this bad, but I feel for you. Not sure this is any different than buying on eBay at times, at least you did not have to pay shipping. ^HA! He broke the seal on my UCS MF long after I found my Lego in such disrepair. If your dog swallowed your ...let's say...Cloud City Boba Fett; would any of you try to retrieve it? ^ Yes - but I have a chihuahua, so it wouldn't be that unpleasant or time consuming. I once had a family of mice decide to take residence in the engine of my riding lawnmower. That was a whole afternoon's worth of fun and excitement cleaning up that stinky mess after mowing an acre of grass. ^^ and give it a quick wash and sell it on eBay. I've purchased collections 3 times off Craigslist. Twice, they were filthy and had tons of "mystery" mixed in. But one time, I purchased every single space set created between 1987 and 1992, in perfect condition stored in their original boxes. For $300. Every Blacktron 1, Futuron, M-Tron, Space Police 1, Blacktron 2 and Space Police 2 (with a few sets mixed in from either side of the time frame). I think out of the 50 or so sets I got from this guy, I only needed to buy/replace like 10 pieces total. So miracles can happen on occasion I've learned. Even if you have to wade through a dozen of these types of transactions, one amazing one can make it all better in the end. One time when I was little, my senile cat used a small box of Lego as a litter box. My parents didn't want to bother trying to sanitize it, and it was tossed in the garbage. I lost an original Forestwoman minifigure, among other things. I had a very similar craigslist find. It looked good going in the car. Upon further inspection, I realized the their cat must have used this container of "LEGOs" as a bed...for years. Sorry...I don't have an accurate weight for the cat hair. My Dad swallow his gold crown and, yes, he did retrieve it....... Wait......you have sucked me in too........must resist.......Back yea thread usurpers! !.....back to the hell called the Predictions thread where yea belong! ^ I hadn't considered that part of the equation. I think proportionally, that would be like trying to pass a Barbie Doll. I'm done with buying Craigslist LEGO from kids. The last time was the worst. It was a round tub, and I could see some fig parts near the top. It was promising. Then I started picking through it. Mega, crayons, and even hair can be dealt with. However, brooches with open pins are bad. I always wear rubber gloves, but they were not enough this time. Too much crud on the bricks, too much damage, and too much risk of disease caused me to abandon the entire lot. The grossest part of these lots is what is left at the bottom of the container after all the bricks and junk are out. What is that powdery mess? ^ My guess is crushed rockets... I think in the US they are called smarties... or so I've told myself anyway. Yuck! White powder can also be dried battery electrolyte, after they have leaked. That may have explained what was all over one of the lots I had purchased off of eBay. Cat dirt... sounds like buffalo chips. I've gotten significantly pickier about the lots I'll buy. Which is why I haven't bought any in 3-4 years. Seems competition for picking them up on Craigslist has increased incredibly over the years too. They're often gone 15 min or less after being listed...at least ones here.